In the Philippines, it’s very rare that you get to hear fellow Filipinos doing biketours outside the country. I first encountered Dean Cunanan and Dang Huervos’ adventures in bikepacking.com (http://www.bikepacking.com/routes/oh-boyaca-colombia/) and crazyguy on a bike (https://www.crazyguyonabike.com/doc/?o=1mr&doc_id=14353&v=1jx). I was really impressed with the amount of detail and generous advice given by these two in their entries and it was a fine treat to actually meet them in person in a talk organized by Lagalag Store Manila. (https://www.facebook.com/lagalagstoremanila/). The placed was packed with people and aside from descriptions of their adventures, we were treated to wonderful photos of their exploits of their trip from Canada, Alaska to the Mainland US and parts of South America. What i found interesting is the pieces of advice i got from them such as running tubeless for tours, keeping costs at minimum, taking the lesser known routes, knowing the mother tongue of the place your heading to and anecdotes of experiences that shows a nuanced and fulfilling experience. For those who may be experienced in doing tours locally but are still clueless on how is it like to go on two wheels in a foreign land, Dean and Dang’s experiences paves the way for most of us dreaming of going out of the confines of home on a bike. After 15 months and close to 6,000km of bike touring and commuting using this rig, I offer my long term review of the Surly Troll. While other riders have written similar reviews with more distance covered in varying terrain, I focus my review on the observed strengths and shortcomings in a range of purposes. Dubbed as an apocalypse bike, the Surly Troll is a 26er touring bike made of Chromoly steel. The beefy build is complemented with a versatile set of dropouts that can accommodate a variety of drivetrain builds (Single Speed, Geared, Rohloff/IGH) as well as ample clearance for wide tires (as wide as 2.75). Some have even used 27.5/29 wheels for this build. Using for touring and commuting, ive setup the troll as geared and single speed. With the capacity to accept different parts, I didn’t experience problems with using existing parts from previous bikes (when I got the frame early 2016, I simply had the parts transferred from my old Cannondale badboy-which makes this model an economically sensible purchase). As regards comfort, the Troll allows you to ride in a relaxed position. Whether you’re cruising or tackling steep climbs, the frame geometry allows you to securely position yourself for a much more enjoyable ride. Moreover, the solid construction of the frame assures you that you’re ready to deal with a variety of terrain as the chromoly steel material can take a lot of punishment and satisfactorily flexes for more comfort. Personally, with the 26/27.5 and 29 configurations, I felt that the Troll was perfect for me as I didn’t experience toe overlap and climbs have been more manageable as opposed to using a 700c/29er bike. Finally for cargo hauling, I believe the troll is perfect for those doing lengthy tours, bike commuting and carrying light/heavy stuff using your bike. With a lot of bottlecage, rack and fender mounts, you’re sure not run out of attachment points for your racks and others. Overall, though I believe that any bike can be made into something to fit your purposes, the Surly Troll’s features obviously makes conversions easier to meet your expectations. During a 37 day tour of the Philippines, one of the things that i took note of is particular pieces of gear used during the trip (check out the first entry here https://pedalpowerphilippines.com/2017/04/05/biketouring-the-philippines-preliminaries-and-leg-1-manila-to-matnog-sorsogon/). One of which is the Ortlieb bikepacking framebag (you can check the specs here https://www.ortlieb.com/en/Frame-Pack/). Ortlieb is one of the premiere companies providing quality touring bags for decades and its 100% waterproof! Similar to their panniers, the framebag uses the same fabric -PU laminated ripstop nylon-light, strong and durable. adjustable straps to adapt to different frame designs and uses a combination of velcro and smooth cloth protecting your frame. The straps are robustly made-assuring you that you wont have problems making sure your framebag stays in place. The single compartment design with internal velcro strap prevents complicated use and even bulging when loaded. The heavy duty zipper is not only waterproof but can be locked when closed making sure that rain will not enter the bag. The medium size that i got can fit about 4 liters of gear. In the case of the tour, i placed all my personal stuff, gadgets, small items and even a small tab and fits perfectly. During the tour, we experienced light to heavy rain and several boat trips and my gear remained dry throughout the trip. In this final entry about our tour of the Philippine Islands, we focus on one set of islands-Palawan which is part of Western Luzon. Heading to Puerto Prinsesa from Iloilo, we took the Milagrosa shipping lines (Php 1,200 for deluxe accommodations 36 hours). We also had a 6 hours stopover at Cuyo which is a small island with a great white beach and sandbar-the best thing is…it’s free! After that stopover, we boarded the ship again to head to Puerto Prinsesa, Palawan. Good thing, I had a friend (former student) who hosted us for the day and she directed us to head to Aldo’s pension Inn which was very spacious and provided all our needs. Since we almost had a whole day, we decided to head to the crocodile farm and saw some other wildlife in the park. We were off at 8pm from Puerto Prinsesa for that 16 hour trip to Coron. When we arrived, a friend who had a resthouse in Coron requested some folks from the island to pick us up and brought us to the Kubo sa Gubat (Hut in the Forest) for our accommodation. It was indeed a very nice place as we were surrounded by heavy vegetation. And for the next few days, we went to different islands and spots in Coron such as the Barracuda lake, Twin Lagoons, the public beach. Morover, we also hiked up to Mt. Tapyas (around 700 plus steps!) and spent a couple of hours at the Maquinit hotsprings which was a few kilometers away from the port. I believe that the Palawan leg is a good way to end the loop because very little cycling was done to cap off a lengthy tour. While there are many activities here, touring the island by bike might also be another option in the future though there are very few towns (and are far apart) in Palawan. Coron has that “otherworldly” character. That is, it’s landscapes and bodies of water are pristinely preserved as locals are highly engaged and very much protective of their lands. With tourism as the main industry in Palawan, expect costs of goods to be quite expensive. Therefore, it is practical to have your hosts/hotel staff cook meals for you. You can buy canned food and other meats at the public market. Overall, I felt that after several weeks on the road, bike touring the Philippines may be much more manageable if one goes around in specific regions/islands as transfers by boat can be tiresome and inefficient. For instance, boat schedules, port locations and even destinations vary from region to region which can greatly affect the scheduling of your biketour. We’re grateful to several people our friends as well as fellow riders from the different places we’ve visited around the country who have offered help and assistance during our trip. Also, we’re thankful to Sorsogon (esp. Natalie Grace Gestre & Cyrk Ryan Lim), Cebu (Hillboy Honoridez), Iloilo (Del Britanico & Harvey Dhash), Leyte (Junnie & Glenda Cadiente), Bacolod (Carla Alcantara & Yvonne Velasco), Palawan (Prixie Tan-Cruz & Janet Oab). Myles Jamito of Mount Anywhere and Sam and Anthony Lau of Ross bikeshop for their continued support. For the past two years in doing long distance trips on a bike, I’ve never had a chance to do cross country cycling. 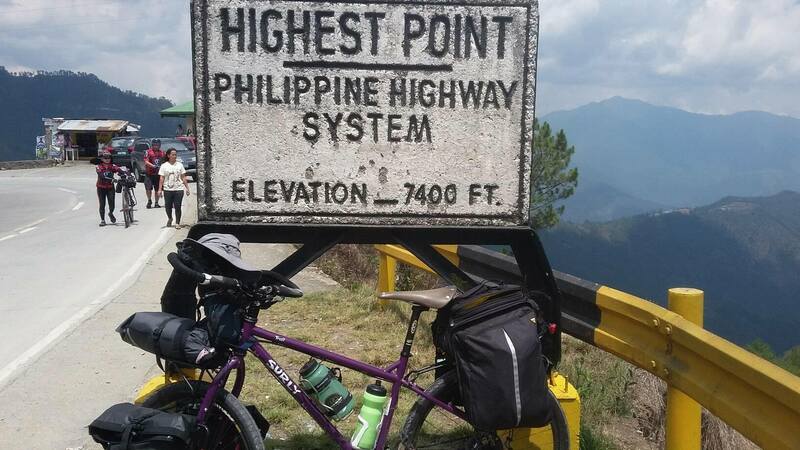 Probably due to our state of living in an archipelago in the Philippines (as well as visa restrictions in a lot of parts of the world), bike touring from country to country is definitely a logistic problem. However, in this adventure, I was fortunate to be guided with one experienced bike tourer-Sk Lah of Tree in Lodge (https://www.facebook.com/TreeInLodge/) to cycle from Singapore to Pengerang, Malaysia. Though it is common here to bike from SG to Johor Bahru, Malaysia via the causeway, the itinerary for this one was different. Instead of cycling with other vehicles in a massive highway, we took another route by boat. Penegerang, Malaysia is part of the Kota Tinggi District and I was told that it was a large area where fishing villages thrived. As of late, the place has been undergoing massive development due to the petroleum industry. Leaving Saturday night, four riders and I left the Tree in Lodge to head to the Changi Ferry Terminal. Taking the east coast park connector, we pedalled 30km from our hostel and camped in one of the camping spots. At the break of dawn, we headed to the terminal after breakfast at Changi Village. The bumboat ride to Pengerang took an hour and costs 14 SingDollars. If you intend to do a daytrip or extended tour from SG to other countries such as Thailand, Cambodia, Vietnam and others, this would be a good entry point as the view is great, costs are manageably low and there are plenty of homestays for you. Be sure to bring lights and there are no light posts on the road. On my first weekend in Singapore, I was fortunate to join a cycling group, Love Cycling Singapore to the iconic Raffles Marina (Johor Straits) Lighthouse. Dubbed as one of the iconic lighthouses in the state, this is a reminder of Singapore’s rich history. In addition, a glimpse of the second causeway to Malaysia makes it a picturesque place to see. Coming from my hostel, I decided to go bimodal via train (Outram Park to Haw Par Villa Station) and pedalled my way (a short distance) to West Coast Park. For a group ride, this was a large one and I got to see different bikes. Heading west, we proceeded to Tuas and passed by the industrial zone. The distance wasn’t too long (about 25km one way) but the heat was quite intense and there were plenty of trucks on the way. I was also happy that a fellow Filipino joined the ride. Joel from Angeles, Pampanga who has been working here for quite some time was very kind and told me about nice routes to try around Singapore. I hope to see this again at Night!